Bite and Booze: Capital City Grill with Boo! One of downtown's nicer dining establishments is Capital City Grill's Shaw Center location. There you can find lunches and dinners served up daily in a business-casual atmosphere. Their menu has a Louisiana feel to it with crab claws and gumbo as starters while serving fried seafood dishes and poboys for lunch and dinner. Capital City Grill also offers standard American upscale dining fare like gourmet steaks, pork chops, chicken breasts, and salads. Not too long ago I met my brother Eric (known to many simple as Boo!) there for lunch to check the place out. We took a couple seats at the bar, though couldn't order any booze, and started our meal out with some seafood queso. The seafood queso proved to be every bit as interesting as it was good. 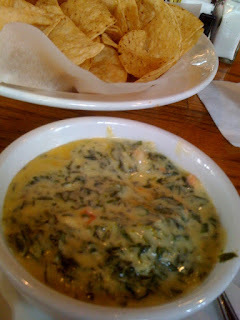 The melted cheese base flourished with lump crab meat, bits of shrimp tails, and spinach. It came served piping hot with some decent, toasted tortilla chips for dipping. Judging by the way we gobbled it down, the seafood queso must have been pretty good! For my meal I ordered the fish of the day lunch special. What I got was a grilled filet of tilapia topped with a toasted pecan glaze and served with steamed veggies and wild rice. As a midday fish special at a downtown grill, this meal turned out to be sensational. 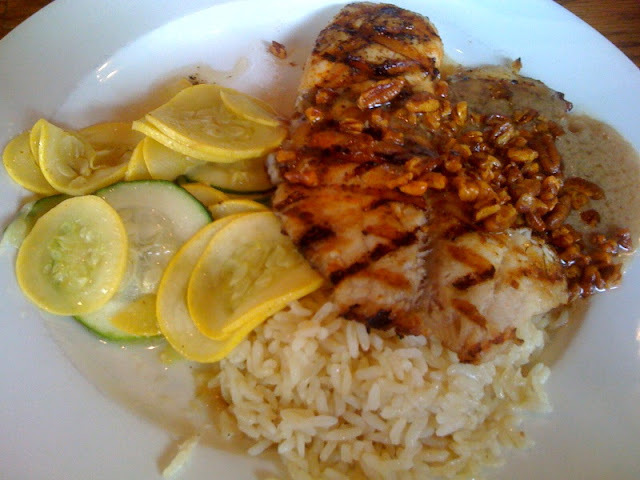 The grilled tilapia had a smooth texture that perfectly parted under the edge of a fork. The toasted pecan glaze gave the fish some sweet and nutty flavors that accented the dish very well. The addition of steamed squash and zucchini along with some rice made the meal not only extremely tasty, but also rather healthy. The price ended up being more that I normally spend for lunch fare, but they have cheaper options on the menu as well. All in all I left satisfied and I might not go back often, but I'd certainly be willing to return to Capital City Grill on occasion.